Scarlet Bugler or Penstemon centranthifolius is an attractive evergreen perennial herb with numerous vertical branches that can exceed four feet in height. 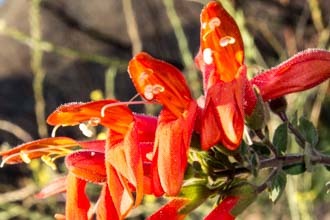 Dozens of bright red to orange narrow tubular flowers in opposite pairs along a two to four-foot flower spike stand out when Spring turns to Summer. Different from most other plants growing in chaparral, all parts of this plant are smooth and hairless - other native plants have fine hairs to trap and retain moisture. Found in a variety of locations that can be dry, open or wooded places at elevations below 6,500 feet. 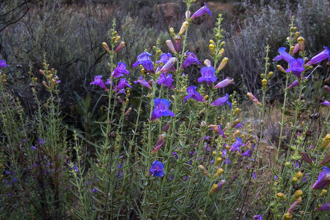 The distinctive blooms have made Penstemons popular in native gardens. Clay soils with excellent drainage seem to be a prerequisite for growing them. It is always impressive that plants find their niche in our wild lands considering that growing them in a garden requires paying attention to factors such as sunlight, soil PH, drainage, soil type, soil moisture and so on. Leaves are a bit thicker than other plants, smooth edged (not serrated), arranged on opposite sides of the stem, length is up to four inches and with the upper leave pairs fused together near the stem (cauline is the botanical term). A distinctive feature of the leaves is that the leaves curl upward near the tips. The color of the leaves ranges from mostly green to gray with hints of green. As with most plants of this type, leaves are longer at the base and shorter near the top. 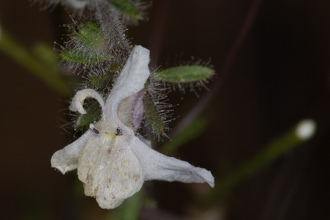 Five sepals (calyx) about a quarter of an inch long contain one inch or more Corolla. 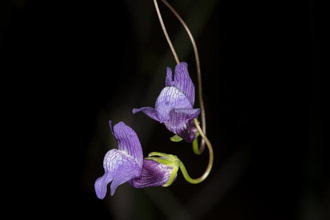 The corolla opening comprises five small lobes which project forwards, the length of the corolla does not change top or bottom, this in effect hides the four stamens and the one infertile stamen. 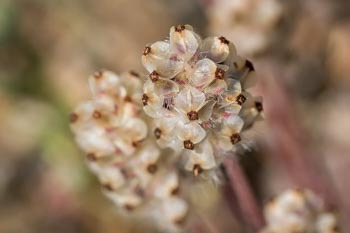 Flowers arranged on all sides of the upright stem in pairs. 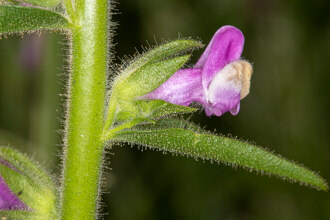 The pedicels (small stalk bearing a flower) point upwards, while the flowers project up, down or level. The flower spike is a good portion of the plant’s size occupying up to two feet of the stem. Bright red with a tubularly shaped corolla, this flower was designed for Hummingbirds. Small bees can also reach the nectar, but regular sized bees are unable to crawl down the narrow corolla. 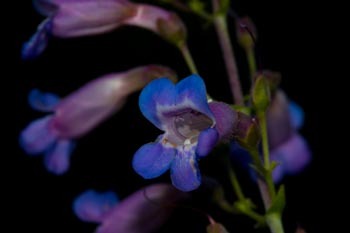 Notes: In some locations this species hybridizes with Showy Penstemon (Penstemon spectabilis), a species with wide-mouthed purple-blue flowers, to produce a penstemon with pinkish-purple flowers, intermediate in size named Penstemon parishii. Until I looked closely at both plants, I did not realize in what ways they were similar: Flowers on spikes, leaves of same color and shape and of course both flowers being five lobed corollas. The more you observe and can relate to other knowledge you have, the more fun this is! 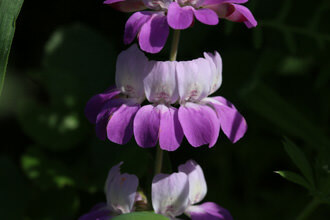 The genus Penstemon had been considered to be in the Figwort family (Scrophulariaceae)., as a result of a genetic analysis, botanists have moved the genus into the Plantain family (Plantaginaceae). www.calflora.net is the source of this info. Last modified: July 17 2017 11:07:15.